Architecture studio Haus completed a modern energy-efficient home with its very own Airstream port. 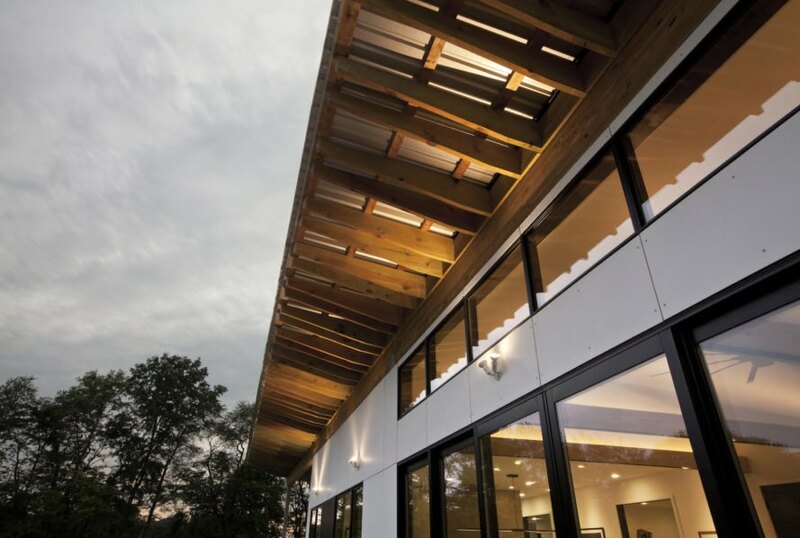 Commissioned by clients with a love of traveling, the Copperwood House in Zionsville, Indianapolis boasts passive and active green-building strategies to achieve an HERS Performance Rating of 43, which the architects say is 60% better than a standard new energy code-compliant home. 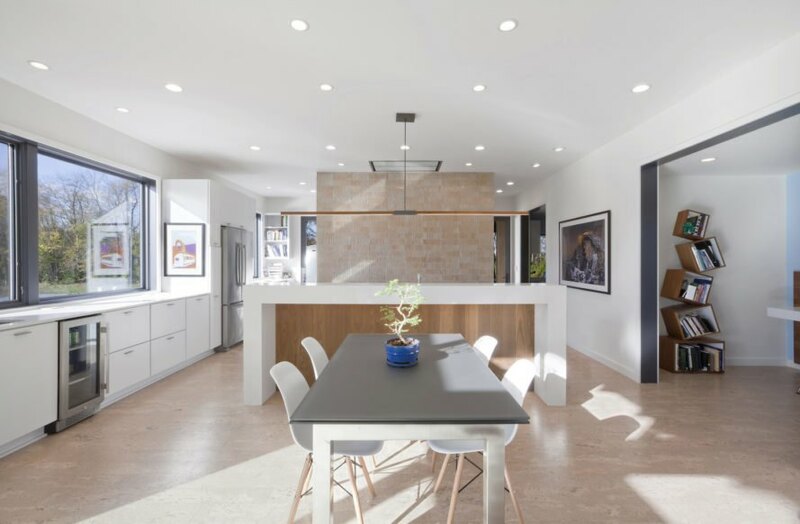 The geothermal-heated home is equipped with low-energy appliances, and all lighting, security, and the HVAC can be remotely controlled via smartphone. 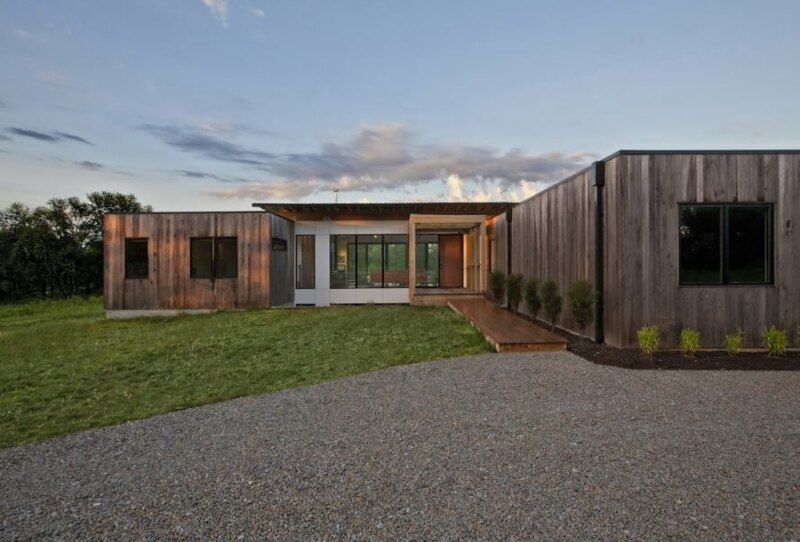 Set on a 19-acre lot with natural habitat and wetlands, the Copperwood House was carefully sited to minimize landscape disturbance and interference with an abandoned on-site pipeline. The site constraints, views, and passive solar principles informed the home’s unusual Z-shaped layout. The low-lying home is clad in thermally treated timber ash that doubles as a rainscreen system and will develop a weathered patina over time. The timber facade is complemented by white cement panels and topped with a slanted metal roof with a deep overhang. 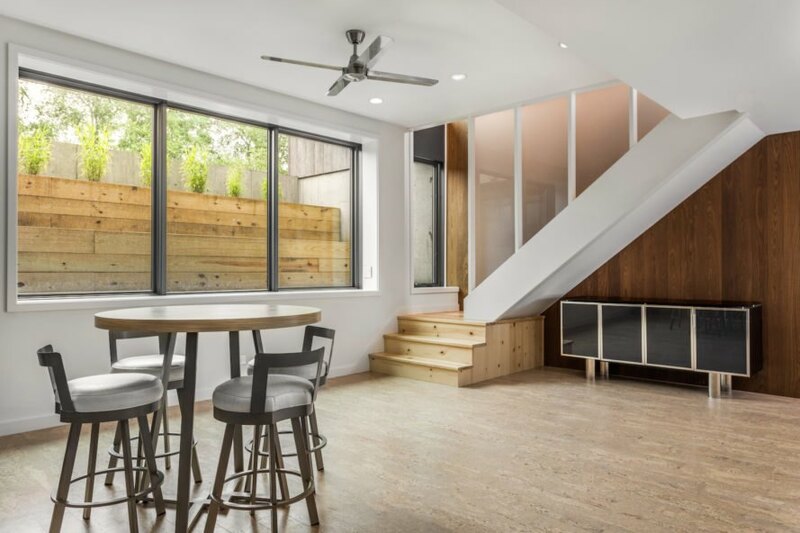 Natural light pours into the modern interior through full-height glazing, clerestory windows, and skylights, some of which are operable to take advantage of the stack effect. Full-height glazing creates the appearance of living outdoors, while natural materials like cork floors and clear Southern Pine stairs tie the interiors to the landscape. The master suite and two bedrooms are located in the east wing. An open-plan dining room, kitchen, and living room are placed at the heart of the home that’s wrapped in glazing. The client’s Airstream was integrated into the design and sheltered beneath the soaring metal roof. The Airstream is connected to power, sewer, and water, and is used as a guest room and office when docked at home. 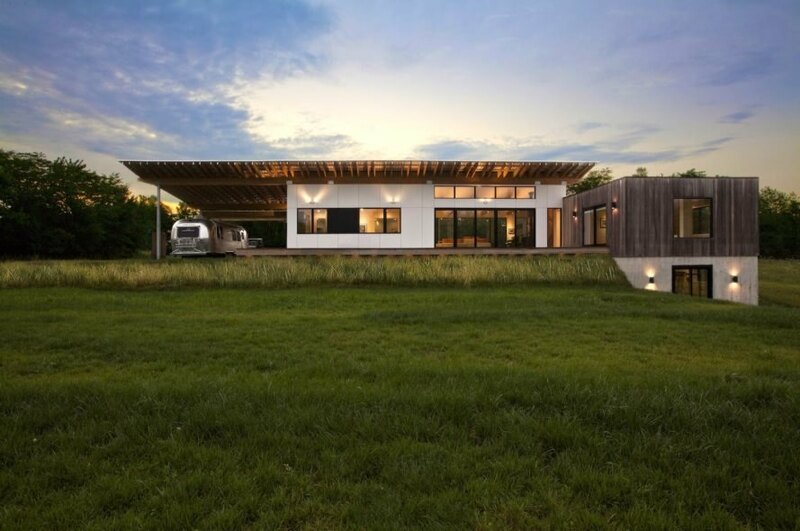 Architecture studio Haus completed a modern energy-efficient home with its very own Airstream port. 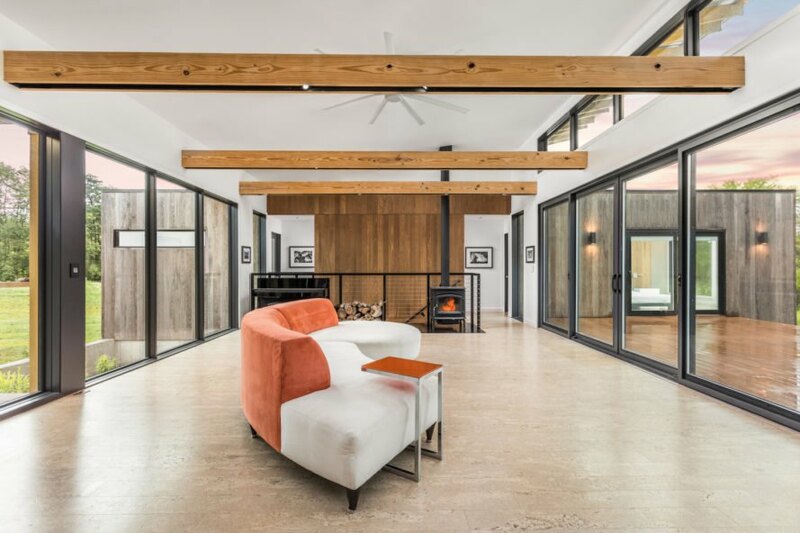 Commissioned by clients with a love of traveling, the Copperwood House in Zionsville, Indianapolis boasts passive and active green-building strategies to achieve an HERS Performance Rating of 43, that the architects say is 60% better than a standard new energy code-compliant home. The geothermal-heated home is equipped with low-energy appliances; all lighting, security, and the HVAC can be remotely controlled via smartphone. 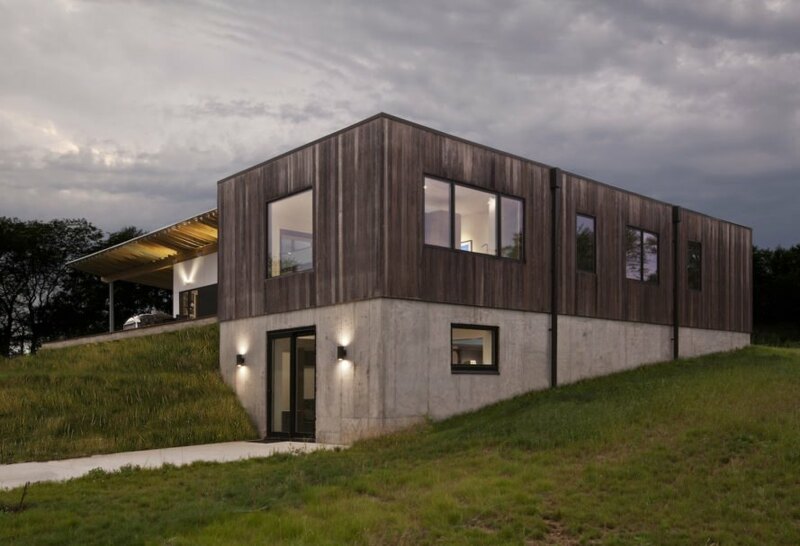 Set on a 19-acre lot with natural habitat and wetlands, the Copperwood House was carefully sited to minimize landscape disturbance and interference with an abandoned on-site pipeline. The site constraints, views, and passive solar principles informed the home’s unusual Z-shaped layout. The low-lying home is clad in thermally treated timber ash that doubles as a rainscreen system and will develop a weathered patina over time. The timber facade is complemented by white cement panels and topped with a slanted metal roof with a deep overhang. 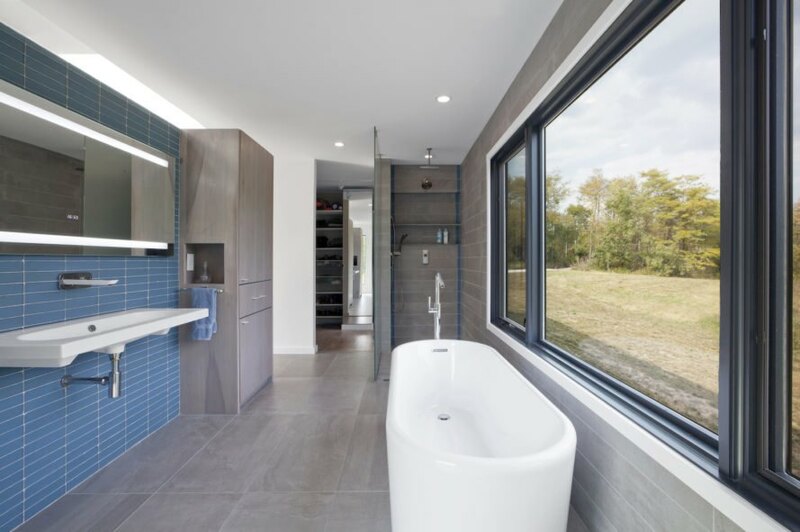 Natural light pours into the modern interior through full-height glazing, clerestory windows, and skylights, some of which are operable to take advantage of the stack effect. Full-height glazing creates the appearance of living outdoors, while natural materials like cork floors and clear Southern Pine stairs tie the interiors to the landscape. The master suite and two bedrooms are located in the east wing. An open-plan dining room, kitchen, and living room are placed at the heart of the home that’s wrapped in glazing.